Adventists, and others such as the Jehovah’s Witnesses and those groups continuing Herbert Armstrong’s legacy, often claim that Easter is derived from a pagan festival. In fact, there are two important points to raise in response to them – a) whether or not Easter is pagan, and, for the Armstrong followers, b) which days of the week the Crucifixion and Resurrection were. The latter will have to wait for now. What about Easter has pagan origins? Did Christians adopt Easter from pagans? Did they Christianise an existing pagan fertility festival and adapt it to celebrate Christ’s resurrection? No. There is nothing pagan about the timing of the celebration of Easter. It’s all based on the Old Testament which sets the times for Passover, and there are several New Testament statements that would contribute to determining the time. The name “Easter”? Probably not pagan in origin at all, and even if it is, this criticism only applies in English-speaking and German-speaking communities. All other Christian cultures use different words, not of pagan origin, and mostly derived from the Hebrew “Pesach”. To condemn Easter as pagan because the name “Easter” is pagan would ignore most of the Christian world for 2000 years, who have never used that pagan name as a reference to this celebration, and who got their dates for the celebration from the Jews. Stop the use of the word “Easter” in English and German communities, and they can just go back to using a word based on the Hebrew. Pascha. That’s the term the Catholic Church uses. It’s Latin, and derived from Hebrew. So certainly the Catholic Church cannot be accused of celebrating a holiday with a pagan name – neither English nor German is the official language of the Catholic Church. And is the word “Easter” of pagan origin at all? It may be, but it is seriously doubted by many. The existence of a pagan goddess called Eostre ultimately depends on one single source – the Venerable Bede. There is significant doubt that he got his facts right, and good reason to believe that there was no such goddess, or that her name was something else. There is yet another theory [via IA here] that the word comes from the one of the Teutonic words “auferstehung” or “erstehen” which mean resurrection. In South Africa we’re lucky enough to have many languages, and those who understand Afrikaans will see the etymological links there. Eerste = first. Stehen is a little less clear, but means to stand up. What did Jesus do first thing in the morning on the first day of the week? He stood up. Simple. Auferstehung! Erstehen! Resurrection! Is there anything wrong with using a standard word from German, or any other language, that may or may not have had, in the even more distant past, origins that may or may not be vaguely connected to paganism? Hardly … otherwise in English we would also have to stop the use of the words God, Amen, holy, Monday, and medicine. So why do we celebrate the resurrection of Christ when we do? According to the New Testament, the resurrection of Christ took place on the first day of the week (Matthew 28:1-10, Mark 16:1-8, Luke 24:1-12, Luke 24:21,46). So, when that time of year came round again and Christians wished to celebrate the Resurrection annually, it would be natural that some would choose a Friday/Saturday/Sunday on which to do it. After all, there is a lot of symbolism in Jesus’ being in the tomb, resting, on the Sabbath, and even more symbolism in his rising after his rest the next day. 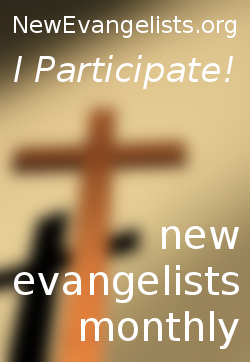 The old creation was restored and turned into the new (2 Corinthians 5:17). God rested after the initial creation (Genesis 2:2). That creation turned to sin (Genesis 3). Christ restored the balance in a life-long event that that ended in his death and resurrection, resulting in a new creation, enabling us to be part of that new creation (Colossians 3:9-10, 2 Corinthians 5:17) and have our relationship with God restored. One week ends with Jesus in the tomb; the next week begins with him rising out of the tomb. One might not agree with the symbolism, but tell that to the people who, in those early centuries, wanted to celebrate this amazing event every year. Right or wrong, the symbolism is not pagan; it’s applied from the Bible. Early Christian writers attribute this practice to the Apostles Peter and Paul, and it became the predominant timing of the celebration in the west, and later throughout the Christian world. Some early Christians thought differently, and followed a practice attributed to the Apostle John (I recall it being attributed to John as well as Andrew or Philip but I can’t find anything about that now). 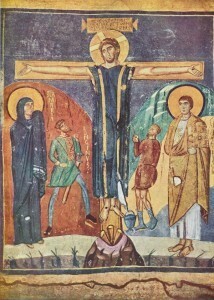 By the time we reach 160 AD we see a dispute arising between the two parties – one, following Peter and Paul, having Pascha on a Sunday, and the other, following John, celebrating Jesus’ death on 14 Nisan and resurrection on 16 Nisan, with the focus more on Jesus’ death correlating with the Passover (hence the name Quartodeciman – 10+4=14.) Polycarp, one of John’s disciples, met with Anicetus, bishop of Rome, and discussed their different practices. They departed unable to convince each other to change, but happy to keep their respective practices and respect each other’s. (Much like modern Catholics, who celebrate Pascha at different times – most with the Western date, but some, with the go-ahead from Rome, with the Orthodox. In fact, all of Israeli Catholics – Latin rite and Eastern rite – will celebrate Pascha on the Orthodox date from 2015.) Eventually the Quartodeciman controversy unfortunately became less civil, and the minority Quartodeciman practice died out. This is a complex topic better suited for the thesis for a PhD in calendrical mathematics, so I will be brief here. Initially the date was simple. Jesus died on 14 Nisan (or 15 Nisan, depending on which scholars you ask. See Pope Benedict XVI’s view here.) Jesus rose from the dead on the Sunday after 14/15 Nisan. That was the Sunday during the Days of Unleavened Bread. Therefore the Christians looked to see when the Jews observed Passover, figured out which Sunday fell in the week after Passover, and then they knew which day they would use. Later the Christians objected to being dependent on the Jews for determining a Christian date, and objected to the fact that the Jews sometimes got it wrong. Simply put, Nisan was supposed to start with the new moon after equinox, but that didn’t always happen, so in 325 AD the Christians dropped their dependence on the Jews, and calculated for themselves when Pascha should occur. Their calculations were not always accurate either, but at least they were united. 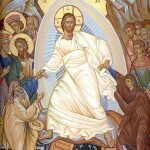 A simple formula for calculating Pascha today is as follows: Pascha Sunday is the first Sunday after the first full moon on or after the March equinox. Keep in mind that the March equinox is set at 21 March because that was the date of equinox in 325 AD; actual astronomical equinox is usually on 20 March these days. Also note that the full moon is also determined by calculation, and not by astronomical determination or by visual sighting of the full moon or new moon. Clearly, there was no pagan practice involved here that needed Christianisation. It is worth noting that the Council of Nicaea that decided on the date for Pascha was particularly averse to things that even looked pagan or was contrary to established Christian practice and thought. Christianity at that time did not like to adopt external non-Christian practices – much to the amazement of anti-Catholics of today. Of note is the Council’s decision to ban kneeling between Pascha and Pentecost – canon 20 states: “Forasmuch as there are certain persons who kneel on the Lord’s Day and in the days of Pentecost, therefore, to the intent that all things may be uniformly observed everywhere (in every parish), it seems good to the holy Synod that prayer be made to God standing.” The pagan Byzantines and Christians had very different ideas about kneeling, and some Christians wanted to avoid that, while some had no problem with it because pagan nonsense was irrelevant to them. Kneeling during the Eucharistic liturgy was therefore scrapped in 325 AD, and this practice remains prominent in the Eastern Catholic and Orthodox Churches – some do allow it in modern times, when the memory of the Councils reasoning had faded, but they still maintain the stricter practice of no kneeling between Pascha and Pentecost. Various customs have developed over time amongst Christians, and Easter eggs and the Easter bunny are two of those often noted for their pagan origin. That is fine, but they are only of peripheral importance to the Pascha celebration, and were added much later. If they are indeed pagan – and there is good reason to doubt this – then they certainly cannot invalidate the actual core celebration of Pascha. Throw away the eggs – they just make people fat. Throw away the rabbits (not live ones, that’s cruel.) In most modern Christian cultures, there is little significance found in these things anyway – it’s commercialism, only on a lesser scale than Christmas. 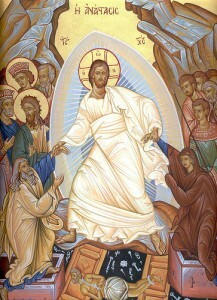 Either way, the Resurrection of Christ remains the centre of Pascha celebrations. 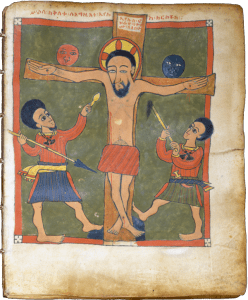 Easter eggs first appear in Christian history in the Middle East, where Christians dyed eggs red as a sign of Christ’s blood. 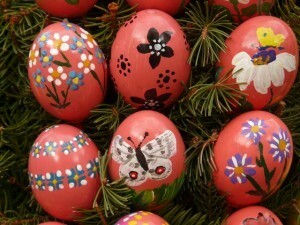 Dyeing or painting eggs can be found in many cultures, many of which were pagan. 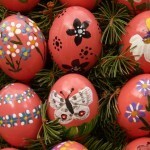 It is therefore easy to claim, without much effort, that Easter eggs were a pagan custom adopted by Christians. However, eggs can also be found in Jewish culture, and long ago, as well as today, eggs were traditionally [IA link here] brought to funerals and gatherings of mourners. There is a pious legend that Mary Magdalene brought such eggs to the tomb for the mourners to eat on the morning of Jesus’ resurrection – the eggs turned red as a sign of Jesus’ blood. There is no historical evidence to support that, however, but it does show that eggs and Jewish customs need to be taken into account when judging whether or not Easter eggs come from paganism, or from Jewish culture. Given the geographic origins of Easter eggs, this suggested origin is far from unlikely. Easter bunnies? – no, Eostre / Ishtar / Astarte / <whatever name you choose> was not symbolised by a rabbit. The evidence for that is incredibly specious – relying in embellishments of embellishments of one single dubious source – Bede. That the egg custom did not begin in the geographical regions of either Eostre or any rabbit goddess just shows how desperate the anti-Pascha arguments have become, having to join together bits of mythology unrelated geographically or historically in order to arrive at an accusation. The most likely reason that rabbits entered the Pascha picture is because hares (which look like rabbits) were thought to lay eggs by some in early times. No, they don’t really lay eggs. 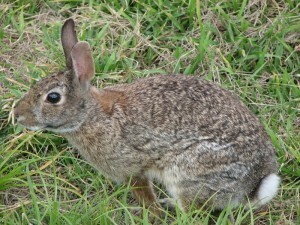 Unlike rabbits, hares nest above ground in grass or depressions in the ground. Plovers, which are birds and do lay eggs, often take over these hare nests after the hares are finished with them, and lay their eggs there. People without degrees in biology, or without even high school biology, sometimes reached the conclusion that these eggs were from the hares. Hence the mistaken idea that hares lay eggs. And so the link between eggs in spring (Pascha time) and rabbits. It may be erroneous, but it’s not pagan. Another theory is that in ancient times, people thought hares were hermaphrodites, and could therefore have babies without mating with another hare. So, mistaken biology led people to use the hare as a sign of the Virgin Mary, who had Jesus without a human father. Mistaken biology is not the same thing as paganism. There are very good reasons to believe that Easter eggs and Easter bunnies grew out of early Christian culture and Jewish culture of the time. We can’t blame them for their lack of biology – St Augustine thought that maggots and flies developed de novo from rotting meat. We can say they had strange ideas about biology, but we can’t blame them for adopting pagan practices when the evidence is as specious as it really is. Fertility symbols are widespread, and encompass a huge range of animals, plants, and other natural elements. There is little solid ground on which to stand when accusing Christians of adopting fertility symbols when it comes to Pascha. In fact, there is more solid evidence to link the original Passover and Feast of Unleavened bread to contemporaneous Babylonian spring pre-harvest festivals, and similarly later in the year with post-harvest festivals (Sukkot.) Just because there is pre-Mosaic evidence of such festivals in the Semitic cultures does not mean that it was wrong for the Israelites to have similar events decreed for them to observe by God. After all, harvest festivals are obvious – so just because pagans thanked their gods for the harvest, doesn’t mean God’s people shouldn’t thank him for theirs. So it is with Christianity. We didn’t go around adopting pagan holidays and pagan customs and pagan beliefs. Ours developed as natural expressions of the Christian faith, and originated in Judiasm where there was an origin outside of Christianity. Similarity to pagan customs does not mean that we adopted them from pagans any more than it means the Israelites adopted their practices from pagans. Yes, to us, Pascha is Catholic, but it does date back to the earliest Christians, whom Adventists don’t recognise as Catholic (even though their beliefs and practices were). Celebrating Easter Sunday has nothing to do with Eostre or Ishtar, but everything to do with when and how and why Jesus rose from the dead. Some Adventists recognise this truth. Some don’t, but use their celebration of Easter as a tool to spread their beliefs to other Christians. Some don’t celebrate Easter at all. These Adventists should reevaluate their rejection of Easter and cast aside their preconceptions that anything Catholic must be bad. Samuele Bacchiocchi is one example of an Adventist who rejects the celebration of Easter. His arguments are very interesting, as they highlight the mistakes typical of how historical evidence can be misused in order to create a false impression about something. I’ve dealt with his arguments in a separate post here. No, it’s not all about Ishtar. Some mythbusting Easter facts from your friendly pagan sceptic. 8 Responses to Is Easter pagan? O.k. I’ll give you that. Now I ask, what was Israel’s intention when worshiping the golden calf? Exd 32:5 And when Aaron saw [it], he built an altar before it; and Aaron made proclamation, and said, To morrow [is] a feast to the LORD. Clearly the intent was to worship YHVH. If God recognizes good intentions, why did he destroy so many of them for this? Israel’s intention with the golden calf was to ignore what God had explicitly revealed to them about himself and to return to some of their old ways. They were punished, not for good or bad intentions, but for ignoring what God had said and making false gods. Ex 32:4b (the people speaking) – These be thy gods, O Israel, which brought thee up out of the land of Egypt. Ex 32:8 (God speaking) – They have turned aside quickly out of the way which I commanded them: they have made them a molten calf, and have worshipped it, and have sacrificed thereunto, and said, These be thy gods, O Israel, which have brought thee up out of the land of Egypt. God did not punish them for worshipping the true God on the wrong day. God punished them for making their own gods. God said that they had worshipped it (the golden calf.) Aaron may have realised this was wrong – after all, he stripped them of all their clothes in shame. He may have attempted some sort of synchretism, attributing the worship to the true God. However, it is clear from their own words in verse 4 and God’s own words in verse 8 that they were indeed worshipping false gods. So, no, there was no punishment for worshipping the true God on the wrong day. Actually if you really knew your bible you’d realize that the resurrection of Christ took place (as it say in the Greek) on the “First of the sabbaths” (mia sabbaton). Since Israel was to count seven Sabbaths after Passover, this is clearly the first of said Sabbaths and the first day of the 50 day count to Pentecost. Every time “first day of the week” or “first of the Sabbaths ” is mentioned, it is not referring to Sunday but to the wave sheaf day, which was always the “morrow after the Sabbath” and began the 50 day count to Pentecost, or the seven Sabbaths count to Pentecost. Acts 20:7 and 1 Cor. 16:2 are not talking about just any Sunday, they are talking about the wave sheaf day. There is absolutely no evidence in the bible of a weekly keeping of Sunday. There is evidence however of celebrating the resurrection once a year on the day of the wave sheaf which started the 50 day count to Pentecost. This would obviously fall on the morrow after the Sabbath just as Pentecost fell on the morrow after the Sabbath. So the only evidence in the N.T. of any “morrow after the Sabbath” observances is two occurances, one on the wave sheaf day and one on Pentecost. These two events that occurred every year are not evidence of a weekly Sunday observance. Historically, “mia sabbaton”, the “first day of the week”, as used in the Bible, has been interpreted as being the day after the weekly Sabbath. That is the case with the earliest Christian writers who knew and spoke the language the Bible was written in. That is in keeping with modern Bible translations, done by people who are experts in the language. It may not always mean that in all contexts, but it certainly can mean that. I am fully aware that the Jews counted 50 days till Pentecost; we do the same today, and that is what the name itself means – pentekoste means the 50th. The context of those passages says nothing about the time of the year, so it is impossible to conclude that. 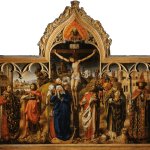 Most Christian scholars through the centuries, and the early Christian writers, understand these passages to refer to a weekly Sunday event. The recent idea that this is not the case is a later invention, held by a minority. There is evidence however of celebrating the resurrection once a year on the day of the wave sheaf which started the 50 day count to Pentecost. This would obviously fall on the morrow after the Sabbath just as Pentecost fell on the morrow after the Sabbath. Which is exactly the Easter/Pascha timing. 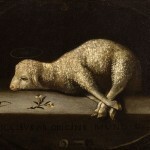 Jesus died on 14 Nisan when the lambs were sacrificed – our sacrifice. Passover day 1 was 15 Nisan. Passover day 2 was the wave sheaf offering, the day of the resurrection – Jesus was the wave sheaf offering. The wave sheaf offering was on a Sunday the year Jesus was crucified and rose from the dead, and so Pentecost was also on a Sunday that year, and we’ve kept them on Sundays ever since. We are not bound by the Jewish/Mosaic calendar. For the Jews the date (Sivan 6) is moveable in that it doesn’t occur on the same day of the week each year. Among Christians who have begun observing Jewish holy days, there is disagreement about whether it is always a Sunday, always a Monday, or always Sivan 6. 7 ¶ On a *saboth day* the disciples came together for to break bread, and Paul preached unto them (ready to depart on the morrow) and continued the preaching unto midnight. 7 Vpon one of the *Sabbathes*, whan the disciples came together to breake bred, Paul preached vnto them, wyllinge to departe on the morow, and contynued the preachinge vnto mydnight. 7 And vpon one of the *Sabboth dayes*, when the disciples came together for to breake bread, Paul reasoned with the, redy to depart on the morowe, and continued the worde vnto mydnyght. So that text provides NO PROOF for worship of the early church on Sunday, since the Sabbath day is what some translators use in this text. Actually the phrase “first of the Sabbaths” means “on the first day of the week”. It is not “one of the Sabbaths” or “on a Sabbath day” – those are bad translations, and any Greek scholar will confirm that. And some examples – Matthew 28:1, Mark 16:1, and Luke 24:1 all use this same phrase to explicitly refer to the day after the weekly Sabbath. The day mentioned in Acts 20:7 can only be the first day of the week. You asked “Should Adventist celebrate the resurrection of Christ?” The answer is yes, but not in a day that may or may not have pagan origins. In Scripture we are not given instructions on celebrating the resurrection as a yearly celebration day. We celebrate His resurrection daily by dying to self, and being quickened by the Spirit. Jesus Himself did not make a single divine act attributing Easter or Sunday for that matter, as any kind of celebration day. I like Bacciocchi’s reponse in his reply to the blasphemous document Dies Domini: “Regarding the resurrection we have already seen that the NT attributes no liturgical significance to the day of Christ’s Resurrection, simply because the Resurrection was seen as an existential reality experienced by living victoriously by the power of the Risen Savior, and not a liturgical practice, associated with Sunday worship. I also like what the Catechism has to say: “God’s action is the model for human action (2172).” I agree, and since God’s action established Sabbath, Baptism and the Lord’s Supper and not Easter or Sunday observance, it is clear that Christians do not need to celebrate Easter, and doing so is merely paying homage to the Papacy. [KJV] Romans 14:5-6 – One man esteemeth one day above another: another esteemeth every day alike. Let every man be fully persuaded in his own mind. He that regardeth the day, regardeth it unto the Lord; and he that regardeth not the day, to the Lord he doth not regard it. [KJV] Matthew 16:19 – And I will give unto thee the keys of the kingdom of heaven: and whatsoever thou shalt bind on earth shall be bound in heaven: and whatsoever thou shalt loose on earth shall be loosed in heaven. [KJV] Matthew 18:18 – Verily I say unto you, Whatsoever ye shall bind on earth shall be bound in heaven: and whatsoever ye shall loose on earth shall be loosed in heaven.